The first month of the 2016 season was a great one at Bears Lake. Eleven of the thirteen anglers who fished with us in April broke their personal bests with some anglers doing this by more than 10kg (22lbs). We opened on Saturday 2nd April with a group of five anglers from England who were here to celebrate Liam’s 30th birthday. With good conditions we hoped for fish from the off. Incredibly on the first afternoon of the season, Dan landed one of our largest fish – ‘Fran’ at a weight of 25kg (55lb 5oz). The great fishing continued with both Liam and Kris smashing their previous bests with Mirrors of 21kg (45lb 6oz) and 23.5kg (51lb 15oz). Amazingly Fran was caught for a second time a little later in the week, this time by Aaron. It is a fish which hadn’t been caught for over a year. The group finished their week with 38 fish with an average weight of 31lb 5oz which included four over 21kg (50lb), 4 over 18.2kg (40lb) and 10 over 13.7kg (30lb). Our second group were another group of English anglers. After initially good catches, the fishing slowed as a result of strong northerly winds. They did, however, manage a couple of personal bests. 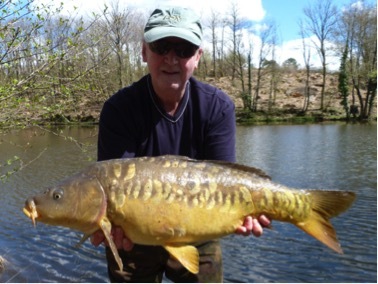 Peter also managed to catch one of our rarely caught heavily scaled original Mirrors. 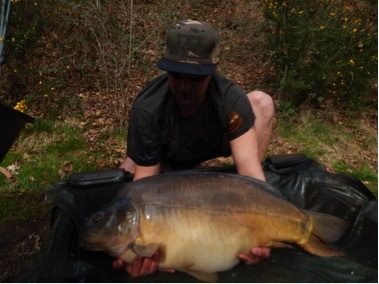 Such fish are become increasingly hard to find in France with many lakes stocking only the larger strains of fish. During the third week of the season we welcomed our first Dutch angler of the year with Felix and his wife Anna. I can’t say too much about his catches as he is hoping to write about them in an up and coming magazine article. Suffice it to say that he caught some really great fish. 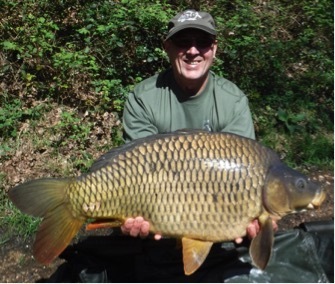 The final week of April saw another group of English anglers make their first trip to France. They had a really good week with 27 fish landed from approximately 40 runs in difficult conditions with cold northerlies and overnight frosts. 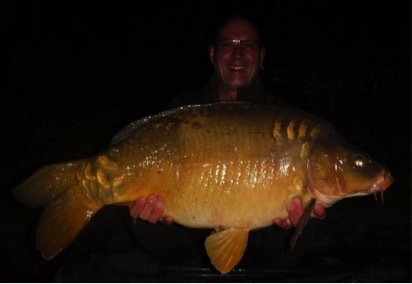 Pick of the fish was Pete's 52lb 15oz Mirror. 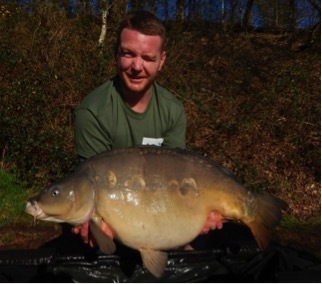 One of the group, Mark managed to break his personal best no less than five times during the week topped by a Mirror of 16.9kg (37lb 4oz) which he had stalking yesterday. They also caught a number of our newly stocked fish. These appear to have settled well and are stunning fish with massive growth potential. Pictured below are one of the new Commons and one of the Mirrors. As I write this we are well into May. The good fishing has continued and we have already had some excellent catches. We still have a couple of weeks left in October of this year with plenty of weeks available in 2017. 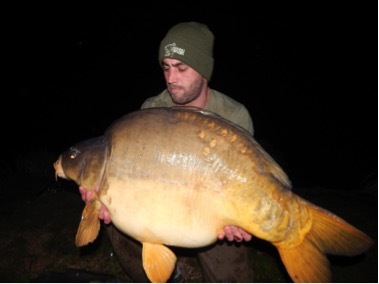 Hopefully I will have some more big fish and personal bests to report at Bears Lake next month.